A unique look into seasonality and seasonal climate changes during warm and cold periods. Yan, H., Soon, W. and Wang, Y.
the late Holocene is constructed by combining seven seasonally-resolved coral and Tridacna gigas Sr/Ca-based SST time-windows with the instrumental SST record from modern interval between 1990 and 2000. 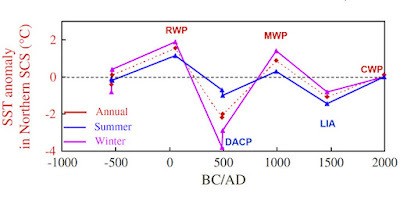 This composite multi-proxy marine record, together with the reconstructions from mainland China and tropical Western Pacific, indicates that the late Holocene warm periods, the Roman Warm Period (RWP) and Medieval Warm Period (MWP), were prominently imprinted and documented in the climatic and environmental history of the East Asia–Western Pacific region. Meanwhile, substantial and significant SST seasonality variations during the late Holocene were observed in the composite record. The observed increase in seasonality (or amplitude of seasonal cycles) during the cold periods around our study area was probably caused by the different amplitudes between winter versus summer SST variations in northern SCS, with much larger SST variation during winters than during summers for the late Holocene. In addition, the distinctive warm, cold and neutral climatic episodes identified in our northern SCS composite SST record correspond well with other paleo reconstructions from mainland China and especially well with the Northern Hemisphere-wide composites by Moberg et al. (2005) and Ljungqvist (2010). 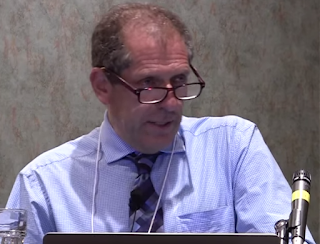 The overall agreement however also calls for more information and insights on how seasonal temperatures and their ranges vary on decadal–centennial timescales. Introducing their work, Yan et al. (2015) note several high-resolution climate reconstructions of the late Holocene provide an opportunity to place current global warming in a long-term context; and they thus proceed to describe the results of their contribution to this important effort, which was to combine seven high-resolution, seasonally-resolved, coral and Tridacna gigas (the largest bivalve species in the global ocean) proxy-SST records together with the instrumental SST record from the 1990 to 2000 interval to provide a 2500-year history of the climatic variations in the northern SCS over the late Holocene. 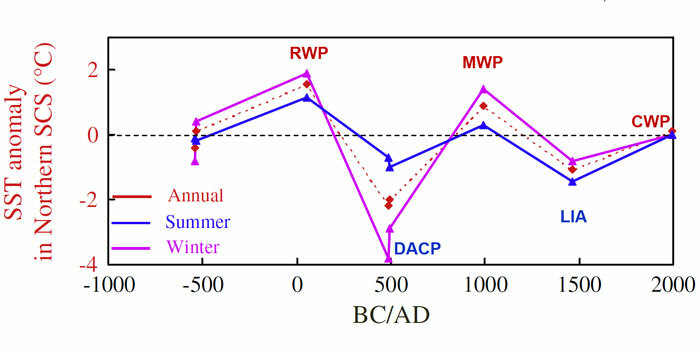 This work revealed the occurrence of two warm periods, one centered on approximately AD 990 corresponding to the Medieval Warm Period (MWP) and one centered on approximately AD 50 corresponding to the Roman Warm Period (RWP), while it also revealed the occurrence of two cold periods: the Dark Ages Cold Period (DACP) between the Roman and Medieval Warm Periods and the Little Ice Age (LIA) between the Medieval and Current Warm Periods (see figure below). 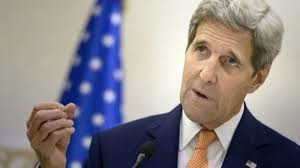 Is there a shift in the alarmist argument from the rising temperature story to ocean acidification as a way of pushing the UN agenda. I have noticed this in recent months, any thoughts or data on this issue.